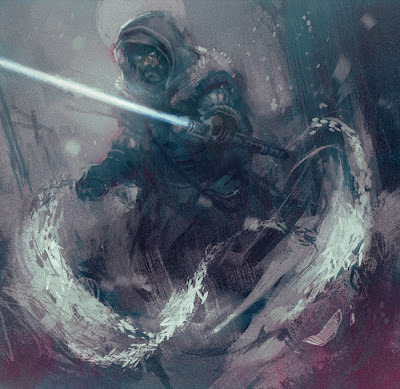 M. Puncekar Illustration: A Jedi. All moody of course. Mike what are find so wonderful about your paintings is the movement and carelessness that alot of artist need, including myself. Why didnt you just flunk senior year at CCAD. They should just hire you as a professor, yeah thats it. Haha, Thanks for the kind words Jessie. I see that CCAD freshman year has severely gotten into your head. Took me a few reads to get what you were saying. I haven't talked to you in awhile, gotta e-mail you soon. Oh, and I wish I could teach a class. Would be a lot of fun to teach a few of my digital techniques, and assign out some sketch book stuff. Just as a way for people to build out their portfolio with editorial and concept work. I'm certainly not qualified... but I so wish I could. I'm so sorry Mike, I think all my writing classes are starting to take their toll on me. Im also kind of tired, but that's what being a artist is all about. Its not so much freshman year taking its toll on me, but transfer sophomore year wierding me out. I try to hard when Im doing a project to perfect it, I need to let go more. All this contemporary stuff is all mind boggling but I guess its working, I have one piece in the may exhibition, so yay. Hopefully we will talk soon.